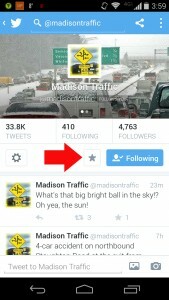 It’s very easy to get alerts from @Madisontraffic sent to your phone on twitter. 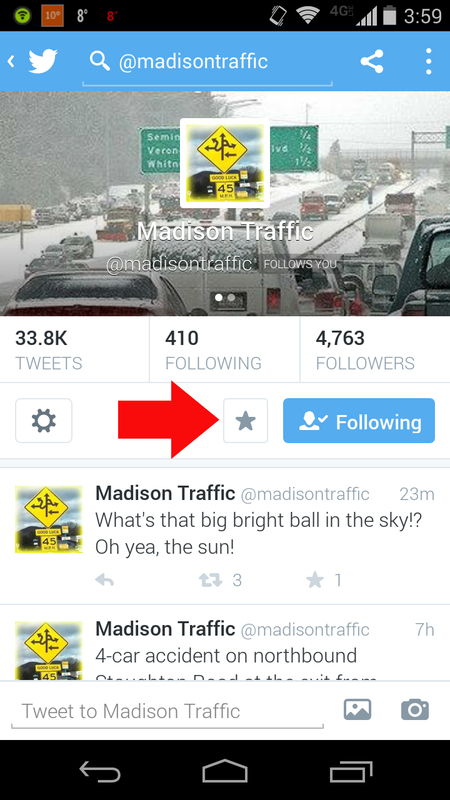 On your phone go to your Twitter app, search for @Madisontraffic, you should see the same screen as below. Make sure you are following us, click the star to the right of “following” and you should get tweets as we send them right to your phone. Snow is predicted to start this evening. The Streets Division will have 30 crews staying on until Midnight and a new crew of 32 coming in at that time. We will be concentrating our efforts on our salt routes. We will not be able to use salt due to the very cold temperatures. All our trucks will be applying sand. With the cold conditions predicted for the next several days we do not anticipate being able to use salt or salt brine to tackle this snow fall. Sand can help provide traction, but it will not melt snow. Traffic will pack down snow which bonds with the pavement. Our plows are able to scrap off quite a bit of snow from the streets. However, since we cannot use salt to loosen up the snow, there will be snow cover on all of our streets, including main roads and bus routes. Because of the snow cover, Tuesday morning’s commute will be slow. Residents are urged to allow extra time to get to work. Drivers should allow extra time to stop and keep a safe distance between vehicles. Here’s what you need to know about traffic at 8 AM on your Friday. There are reports of an eight car crash on Interstate 90 east bound in DeForest near the Highway V exit. Avoid this area. A very serious accident occurred earlier this morning at US Highway 151 southbound and American Parkway. The right lane is currently closed, and I expect it to remain closed for quite some time as the Wisconsin State Patrol Crash Reconstruction Team investigates the crash. Madison Police say to expect delays for several hours. The left lane on Interstate 90 eastbound near Janesville and mile marker 170 is crawling along due to to a crash. You’ll see slowdowns starting near Wisconsin highway 26. The left lane is now closed both east and westbound on the interstate in the area. US Highway 151 southbound is reportedly at a dead stop near Hwy 73 due to a multiple vehicle crash. It’s been backed up for some time with no end in sight at this time. The westbound Beltline is seeing it’s usual delays. You’ll be slow from Stoughton road through Fish Hatchery road. It’s slippery out there. Use caution and leave some extra time during your commute. **REMINDER: WB Beltline overnight lane closures will be in place until NOON on Sunday between Monona Dr & Fish Hatchery Rd. This has nothing to do with the marathon, but still pertinent info. Many roads will be affected by the Madison Marathon on Sunday, November 19. CLICK HERE for details on Madison Metro detours. CLICK HERE for information on road closures on UW Campus. CLICK HERE for the Madison Marathon website. CLICK HERE for the Madison Marathon Facebook page. CLICK HERE for story on road closures from Channel3000.com. MIDDLETON: Parking, leaves, snow, etc. The City’s leaf collection crews will be on the streets Saturday, November 8, in hopes of collecting more leaves prior to winter conditions. Residents are encouraged not to park on the street so that the crews may remove leaves more efficiently. Whether 1″ or 10″, it’s always good to be prepared for snow. The possibility of slippery driving conditions exists for the Madison area, anywhere from Sunday evening through Monday evening. As per usual with these sorts of things, Mother Nature will be unpredictable, and nobody knows where, when, or how much right now. I will add links here as they become available to me. CLICK HERE for a release from Wisconsin Emergency Management. CLICK HERE for local forecast from the National Weather Service. CLICK HERE for Winter Driving Safety Tips from the Wisconsin DOT. GREEN/DANE CO: Hwy DD and Hwy D CLOSED for semi snafu. A semi-trailer split in half on Hwy D near Hughes Rd in Green County, just south of the Dane Co line. This is in the N9200 block. They need to unload the semi before they can move it and this is going to take a long time. Hwy D is closed near the Dane/Green Co line, and Hwy DD is closed in Dane Co at Hwy D.
Shortly before 5pm, roads will start to close at State St. All streets that intersect State St will be CLOSED by 5pm. E. Gorham will be detoured onto Blair St, W. Johnson St will be detoured onto Bassett St. The detours will be in place until around 2am Sunday morning. CLICK HERE for info on Madison Metro detours. CLICK HERE for traffic detours. FREAKFEST: Causing Madison Metro detours as early as this evening. Multiple routes will be detouring in the Downtown and UW Campus areas throughout the weekend. · Buses will be on the Capitol Loop Detour beginning at 6 PM. · Routes 2, 4, 5, 6, 7 & 8 detour all day from the downtown area. · Route 80 detours from State & Lake St.
· Routes 81 and 82 will be following a ‘combined special event’ route & schedule. · Buses will follow the Capitol Loop Detour all day. CLICK HERE for more information on Madison Metro detours due to Freakfest.